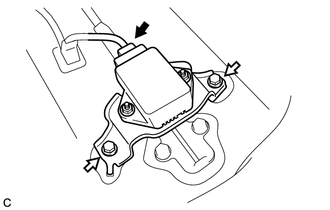 (a) Install the yaw rate and acceleration sensor to the bracket with the 2 nuts. 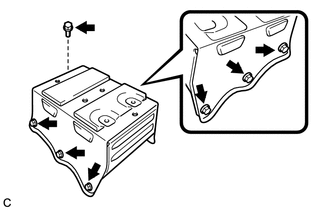 (b) Install the yaw rate and acceleration sensor with bracket with the 2 bolts. Be sure to insert the yaw rate and acceleration sensor claw into the stopper hole while installing the yaw rate and acceleration sensor. Do not damage the yaw rate and acceleration sensor. Make sure that the yaw rate and acceleration sensor is installed securely. (c) Connect the connector to the yaw rate and acceleration sensor. Make sure that the yaw rate and acceleration sensor connector is connected securely. (a) Install the No. 4 center member floor reinforce sub-assembly with the 7 bolts. (b) Return the floor carpet assembly to an original state. 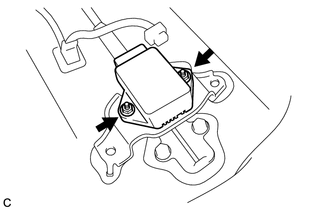 Refer to the instructions for Installation of the front seat assembly LH (See page ).